African American cowboy Charley Willis was recognized as a singing cowboy who authored the popular trail song, “Goodbye Old Paint.” Willis was a skilled cowhand who not only sang songs from the trail but who contributed to preserving authentic cowboy music from the era. Charley Willis was born in 1847 in Milam County, outside of Austin, Texas. Freed after the Civil War he headed to West Texas at age eighteen and found work breaking wild horses at the Morris Ranch in Bartlett, Texas. In 1871, at age twenty-four, he rode the Chisholm Trail one thousand miles north into Wyoming Territory as a drover. Charley was musically knowledgeable and talented. He became known for the songs he brought back from the trail. 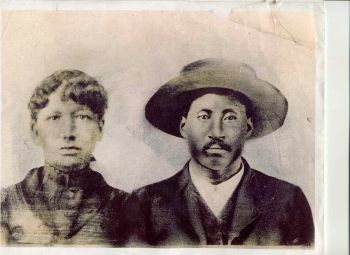 Charley Willis married Laura Davis around 1870. They had four sons and three daughters. Willis died in 1930 at the age of eighty and is buried in the Davilla Cemetery, which is adjacent to the property Willis owned near Bartlett. Family tradition claims that Charley did indeed have a horse named Old Paint, who was a trusted companion and confidant on the trail. Charley’s great-grandson Franklin Willis continues Charley’s legacy by keeping his four hundred descendants connected. Tricia Martineau Wagner, Black Cowboys of the Old West (Guilford, Connecticut: The Globe Pequot Press, 2011); Sara R. Massey, ed., Black Cowboys of Texas (College Station, TX: Texas A&M University Press, 2000); Jim Bob Tinsley, He Was Singin’ This Song: A Collection of Forty-Eight Traditional Songs of the American Cowboy, with Words, Music, Pictures, and Stories (Orlando, FL: University of Central Florida, 1982).